Of the many common names accorded to this plant, Monument Plant is the one that best describes this amazing wildflower. They can grow to well over a metre in height. The stems are packed with white-to-pale green flowers which have bract-like leaves protruding outwards. They are larger at the base of the stem and smaller at the top giving the overall plant a cone shape. Frasera speciosa is a biennial plant which flowers in the summer, reaching its full height by the middle of July. 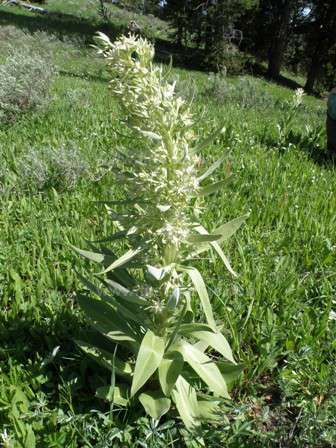 It is not at all fussy about habitat and grows in fields, along roadsides, in open and shaded areas and appears both in mountain foothills and subalpine positions. The range of Elk Weed is considerable, it grows throughout the Rocky Mountains and south to New Mexico, California and Mexico. The roots of the plant are edible if cooked and the leaves were dried and smoked by the American Indians. Bedevilled with various common names, Monument Plant best describes this impressive wildflower. The scientific name Frasera is in honour of Scottish plant hunter and botanist John Fraser. One of the intrepid botanical travellers, Fraser was commissioned by Kew Gardens to travel to America to collect plant species. As a result of his travels around the globe he was responsible for the introduction into cultivation of over 200 plant species. The name Elk Weed is given to the plant because both moose and deer graze the leaves. 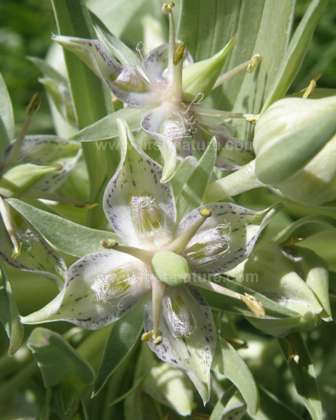 Monument plant is a surprising member of the Gentian family which is well represented in the Rocky Mountains. Species found there, which are more typical of the gentians, include Mountain Gentian - Gentiana parryi, and Rocky Mountain Fringed Gentian - Gentianopsis thermalis. The specimen shown on this page was photographed on the edge of pine woodland in Yellowstone National Park.